Saitek has launched the Cyborg Keyboard, it is fully customisable, tri-colour key backlighting which can be applied in different colours and brightness for the key gaming areas of the keyboard. The red, green or amber backlights can be programmed to highlight the keys most often used in gaming – the WASD, cursor, ˜C and Numpad keys – for convenience and practicality, with current settings saved even after a system reboot. The touch-sensitive, backlit dashboard control panel allows the user to quickly convert the keyboard from normal mode to gaming mode by pressing the Cyborg button. Gaming mode instantly disables the Windows keys (which can quit games if accidentally pressed) and configures the colour and brightness of gaming keys. Programmable features include enhanced multiple key presses in gaming areas for complex in-game commands and 12 programmable ˜C keys with three programming modes. In addition, keyboard settings and complicated in-game commands can be saved as game-specific profiles using Saiteks SST software so the user does not have to re-program the keyboard each time a new game is loaded. The Cyborg Keyboard has adjustable rake angle at the front and back for maximum comfort, and to prevent strain injuries from intense keyboard use. The WASD and cursor keys are metal plated to prevent wear from prolonged gaming use, and the keyboard also includes pass-through USB, audio and microphone sockets for neatness and increased cable reach. While the Cyborg Keyboard is designed for gamers, it can be quickly switched to Normal mode to make it suitable for a work and home environment. In normal mode the ˜C keys can be programmed to open files and applications or perform specific actions, such as printing, at the touch of a button. Media keys simplify watching films or listening to music. 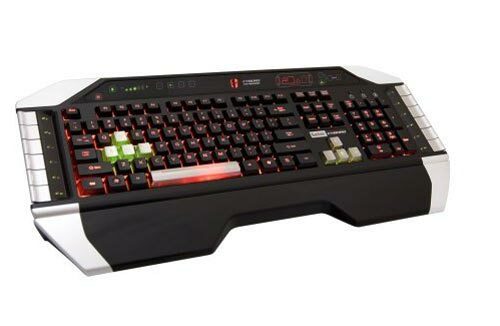 The Saitek Cyborg Keyboard is available to pre-order online for $79.99 from Amazon.